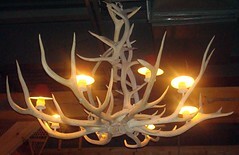 An antler chandelier can become the prized centerpiece of rustic décor in a living or dining area. These unique lighting fixtures add a note whimsical, natural beauty to any room. Western, country and wilderness decorating schemes are ideal for the central placement of an intricate interweaving of antlers accented with warm light. Sometimes, though, a more surprising application may include contemporary or modern designs. In those cases, the contrast between natural and synthetic materials can be quite striking. Whatever the application, the beauty of antlers is worthy of taking center stage in the room. A casual living area can be a great place to use a deer or elk antler chandeliers. It will provide a focal point for the room while casting a warm glowing light. Because the antler constructions can be quite large, it is important to be sure they do not overpower the room. Often it is best to use them in rooms with very high ceilings. To increase the amount of available light, the chandelier can be combined with floor lamps or table lamps. This will make a cozy feeling for guests and family. Matching lampshades with western designs or solid colors can increase the feeling of a unified theme. In a dining area, the intertwined antlers will hang nicely over the center of a large table. This will add special wilderness flair, even during formal dinners. This effect is especially attractive when combined with rich wood paneling and furniture. This type of usage is often referred to as ranch-style dining décor. This new style is quite popular in vacation homes and country retreats. Sometimes, however, a sleek, modern dining area may be accented with this particular lighting design. The creation of contrast draws interest and provides a conversation piece for diners. Dining areas and living rooms are not the only place for these creative fixtures. Many people enjoy them in entryways, dens, and family rooms. Wherever they are placed, they capture the imagination and make a statement. That is the greatest value they provide. When a striking statement is called for, use an antler chandelier to make any room come alive.